Thursday, May 17, 2012: Back on the trail after three zero days, and today wasn't a full hiking day because of the long drive from home. I'm excerpting from my personal journal to save time - will probably do that more often, as I've learned a lesson from the three days off - I've been pushing myself too hard. Not only will I have to listen to my body more carefully, I'll have to cut back on the daily miles and on the daily computer time. 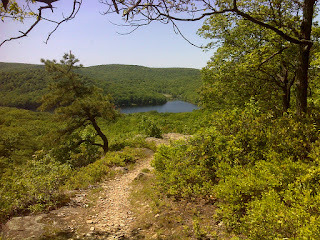 After making a wrong turn I finally got to the Seven Lakes Drive parking lot and was on the trail at 11AM. Then I almost immediately made a wrong turn on the trail, wasting a bit more time. Once on the right track I hiked south on some newly rerouted trail, clearly new this year, only returning to the old trail as I emerged at the first vista point, which looked east to Bear Mountain. There was a second vista east higher up, then the trail hopped quickly over to a rock outcrop on the other side of the ridge, a hundred yards away, with a great view west. Then it follows the bedrock along that west side of the ridge past several more viewpoints with the same view until it reaches the blue blazed side trail to the West Mountain Shelter. It was a half mile walk to the shelter from the AT, but what a fantastic setting! The shelter is perched on bedrock with a panoramic view out its front overlooking the Hudson River. The shelter itself is in fairly bad shape – another of those of the same design as Fingerboard and probably built in the same time frame (1920’s). It has a missing floor board and a big hole in the roof. Back to the AT (southbound), right after this side trail it begins to descend pretty steeply down to the bridge breaching Beechy Bottom Brook (say that fast ten times), then crossing the busy Palisades Interstate Parkway with cars roaring by at 70 miles per hour – scary. Then the trail ascends Black Mountain. It seemed a quick ascent, steep but not too rocky until near the top. There you emerge to a wonderful view of the New York City skyline 37 miles away (according to the sign on the Parkway below). I had heard that you could see the city from the trail, and am so glad I had a low humidity clear day to catch that view. That’s exactly how I like to experience the Big Apple – from a good distance, from a wilderness setting. That’s as close as I care to come to the noise and bustle and pollution, thank you very much. As I started coming off Black mountain I passed the maintainer for the section between there and William Brian Shelter – a gray haired woman, small and wiry. She was eating lunch on a rock and we had just a brief conversation in which I probably thanked her four or five times for the work she does that benefits us all. Just beyond her was a very nice viewpoint overlooking Silver Mine Lake, then the trail drops down into a pretty little valley, just a couple hundred feet below the ridge, then back up to the ridge again for the last mile to William Brien Shelter, my turn-around point. It was 3PM when I got to the Shelter and there were two guys there who were apparently settling in to camp there tonight. One asked me about water in the direction I’d come from and I told him about the nice little stream in the valley a mile away. I hope they didn’t go that far for water, because there’s a side trail from the shelter down to Silver Mine Lake that’s much shorter – reaching a stream that feeds the lake well before reaching the lake itself. On the way back I was passed by an ‘angry hiker’ who seemed to be yelling at the trail every time it took him up rocky slopes (or at least shouting at something). I didn’t ask, but from the looks of him – beard, etc. – he was a thru-hiker who was slack-packing to Bear Mountain Inn. I told him to watch for the NYC skyline as he passed it and he did stop and take a quick photo. Back down at the Beechy breach I sat down on the bridge to eat a snack before beginning the ascent and the same guy passed me again, in even more of a fury. He had taken a wrong turn at a place where, if I had not noticed the turn on my way south I might have also missed an AT northbound turning left where the Ramapo-Dunderberg Trail goes straight ahead. The turn isn’t well marked. I told him that I had heard that the trail farther north is even less well blazed to which he just commented ‘we’ll see’ as he hurried on his way. 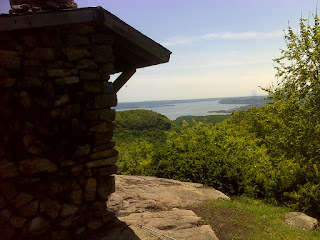 When I got back to my starting point it was not quite 6PM so I took a quick hike starting up Bear Mountain – just a half mile to the crossing of Perkins Drive before returning to my vehicle. And them's the facts, Ma'am. It was only when I started my usual after-hike routine that I fully learned the lesson that these three days off the trail were trying to tell me. It was eye-opening to note how much more lively I felt than I had in the same situation in recent hiking days. I suddenly realized how thoroughly exhausted I had been – virtually every night. I had been really pushing myself too hard and didn’t fully realize it. Yet it’s all so clear now, given that 3 day break. I mean I was tired tonight, and wanted to do nothing but go to sleep after eating, but by comparison, I was a wreck – a total zombie – for the last several nights prior to this break. No wonder I was rebelling and feeling so down. There’s no question that I need to slow down. And that may mean revisiting my goal of finishing by the end of October. I should allow myself the entire calendar year if I need it – just get to Maine without killing myself and then see if there’s enough time left to do that last 354.2 miles at the end of the year. If it’s still possible then maybe that would be the time to really push myself. So, yes, I'm optimistic that I can still achieve this goal. I only need to hike eleven or twelve miles per day to finish by December 31st. And since I don't mind being on the trail for eleven or twelve hours a day, or even more, I can do that at a snail's pace if I feel like it.